Australia’s earliest surviving photograph is said to be by a Tasmanian photographer, George Baron Goodman, and of Dr William Bland, an ex-convict, prominent surgeon, humanitarian, social reformer and inventor. It was taken in 1845. In New South Wales it is from a gentleman engaged to work at the Sydney Mint that some of our earliest photographs stem. Robert Hunt is considered by many to be a pioneer of photography in New South Wales, so much so that 160 years since his first known photograph was taken, his works are still on display. Hunt went on photographic excursions, often with another Mint associate, William Stanley Jevons, often around Sydney Harbour in his boat the 'Terror'. The two men took views of landscapes in and around Sydney. Hunt’s early stereoscopic views dated 1855, are believed to be some of the earliest photographs on card. He worked with Professor John Smith, founding professor of chemistry at the University of Sydney, to pioneer dry plates for expedition photography. In December 1858, with other amateur photographers including John Smith, M. F. Moresby and Captain Edward Ward (also from the Mint), he exhibited his work at the first photographic conversazione of the Philosophical (Royal) Society of NSW, and again, at the second, in December 1859. Hunt’s son, William (Billy) Lewin (?-1943) was a naval draughtsman, who also was a photographer. The 'Terror' was a beautiful light skiff or 'wager boat' according to other sources. Robert Hunt's family background was notable. His grandfather John was an influential, reformist, printer and publisher. The radical liberal stance of his newspaper The Examiner, edited by John's brother Leigh, led to a series of court appearances for the brothers and ultimately two years imprisonment on a charge of seditious libel. Leigh managed to turn his prison rooms into a kind of political and literary salon, visited by such personalities as philosopher Jeremy Bentham and poet Lord Byron. Robert Hunt's father, Henry, was also a journalist and publisher before selling the family newspaper to philanthropist Robert Fellowes and retiring to France, where Robert received his early education. Our interest was sparked further when we recognised an image from an old article, where some of his earlier works had been the inspiration for paintings, as a photograph also seen online at the excellent digitised State Library of New South Wales (Mitchell Library) Collection. 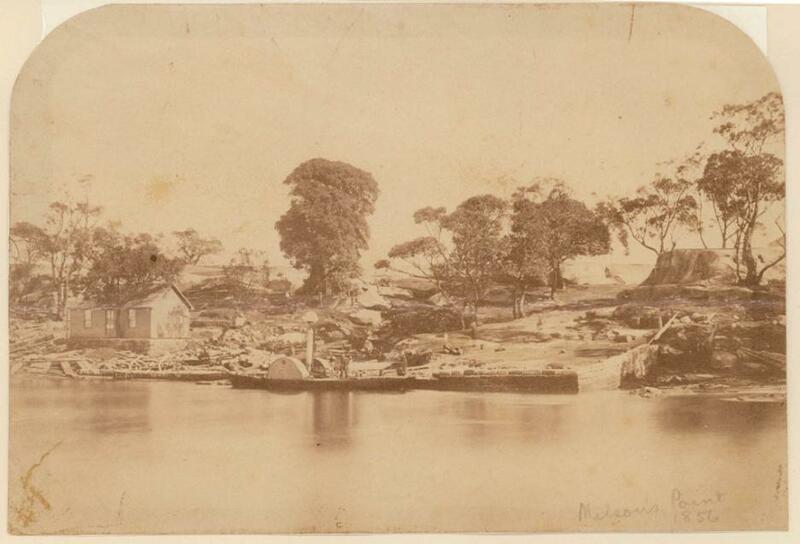 Milson's Point, North Sydney, in 1854. Our first illustration of the Shore in early days presents a picturesque view of Milson's Point the chief approach to all northern suburbs of Sydney-as it appeared to the eye from the waterfrontage nearly half a century ago. The view is reproduced from a water-color picture which hangs in the drawing-room of Mr. H. T. Green, boat-builder, of Lavender Bay. This picture was enlarged from a small photograph taken in 1854 by the late Mr. Robert Hunt, C.M.G., Deputy master of the Sydney Mint. Mr. Hunt was an amateur photographer of considerable note in those days, and excelled in an art then in its infancy-for Daguerre had only a few years previously discovered the first crude method of fixing impressions made by light upon a sensitive surface, and photographers had not perfected the methods now in general use. Mr. Hunt was one of the early residents of North Shore, having taken up his abode there soon after his arrival in the colony in 1853, with the appointment of chief clerk in the bullion office of the Mint. He married, in 1860, in the old St. Leonards Church, which is the nucleus of the present St. Thomas's Church. Miss Mary Paul, only daughter of one of the earliest Shore residents. Her mother, Mrs. John Paul, is still living, and is 87 years of age. Before leaving England Mr. Hunt published a "Manual of Photography," in 1852*. A copy of this work-fourth edition, 1854-was presented to the North Sydney School of Arts, and can be seen there. In 1870 Mr. Hunt was transferred to the Melbourne Mint but in 1878 he was appointed Deputy-master of the Sydney Mint, which position he held until his death on September 27, 1892. Mrs. Hunt is still an esteemed resident of Milson's Point. If the shades of Captain Cook and Governor Phillip were to visit Sydney Harbor, what a surprise their ghost ships would receive! Towards the close of the last century the land known as Milson's and Kirribilli Points was granted to an officer named Ryan, and the locality went under the name of "Ryan's grant" by the old colonists. Eventually a portion of this land passed into the possession of three brothers, well-known early colonists. Messrs. Robert, George, and John Campbell. Upwards of fifty years ago the Campbell Brothers leased Milson's Point to Mr. W. H. Paul, who built a house on the top of the hill. Under the lease Mr. Paul had the option of purchase for a thousand pounds, and he exercised his right. Some of the remainder of the Campbells' property was purchased by Messrs. Thomas A. Dibbs and Edward Lord. Of late years the North Shore Ferry Company purchased a portion of Mr. Paul's land, and comparatively recently the remainder was resumed for tramway and railway purposes. In 1824 or 1825 Sir Thomas Brisbane granted Mr. James Milson, sen., fifty acres of land between Careening Cove and Lavender Bay. Mr. Milson could have had a much larger area granted to him but the land not being suitable for cultivation, he selected a large area in the neighborhood of Hornsby with fertile soil, and some at Wollumbi. He was one of the first residents on North Shore, having built a house there in 1825. The picture given of this spot in the fifties takes us back to a period separated from our own by a gulf of which the mere mention of the number of years which have elapsed gives no adequate measurement. Where the numerous dwellings of North Sydney now stand, the steep cliffs and sloping heights were then covered with virgin bush and dense forests-a great deterrent to early settlement The waters of Hulk Bay-or Lavender Bay, named after Mr. George Lavender- are on one side of Milson's Point, and Careening Cove and Neutral Bay on the other. The writer is informed by Mr. J. S. Abraham that the aboriginal name of Lavender Bay was Quilby. Mr. Lavender was boss of the hulks, having charge there, pending dispatch to Swan River, West Australia. There are 101 steps leading from Lavender Bay, and, by a strange coincidence, the scenery is in some respects not unlike that beyond the creek at Yokohama, from the 101 steps at the summit of which is the house known to all Japanese tourists as Fujiya, or the abode of the wistaria. Governor Macquarie gave the late Willam Blue, commonly known as "Billy Blue," a grant of about 90 acres of land, now known as Blue's Point, and extending easterly towards Milson's Point. Mr. Blue, who was a native of the West Indies, had a family. His daughter married Mr. Lavender, to whom was given that part of the grant now called Lavender Bay. Those of our readers who know what a restless and ever-busy scene is here now, can, from a glance at our illustration, form no conception of the dreamy repose of the surroundings of Milson's Point in 1854. 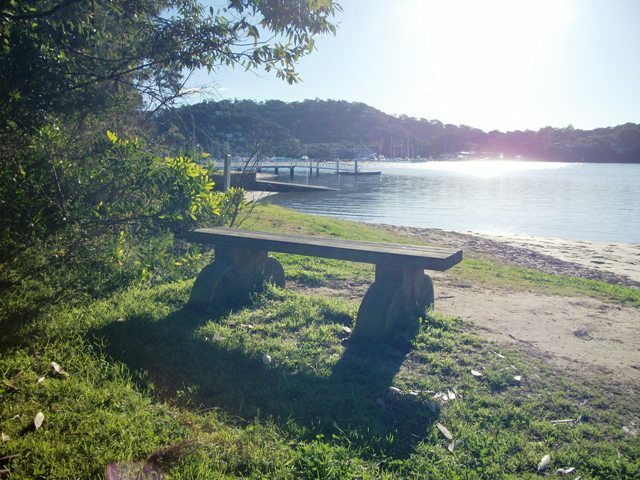 In the evening there used to be room for the whole population of the then North Shore to congregate at the Point, and breathe the fresh breezes off the water-that splendid sheet between Port Macquarie and Dawes Point. There lay the anchored fleet-all sailing vessels then-and small craft skimmed about the placid harbor, with its verdant dales and bush shores. The distance between Milson's Point and Dawes Point does not exceed 1300ft.Without the well-regulated steam ferry service of the North Shore Ferry Company the rapid growth and prosperity of North Sydney could not have been possible. Ferried over in an open boat, with rain and wind beating in one's face, and then to slip and slide on a rough landing stage, was a very different experience from the comfortable boat, fine waiting-rooms, covered wharves, and enclosed arcade right to the cable train and railway station. During the first half century of the existence of the colony the North Shore woods were much subdued by gangs of convicts, who were employed felling the giants of the soil. All the early officials speak of the slopes of the Shore as covered with heavy timber, mostly gumtrees of large size. Dr. Lang mentions that in 1794 on the site of Scots' Church, Sydney, a blue gum 6ft in diameter was cut down, and in 1824 it took several days to burnout its roots. In our view of Milson's Point in1854 there appears one of the old figtrees, supposed to be a century old. It is still standing, and has seen many Governors, since Captain Phillip, come and go. Some local traditions cluster around it. Should its vegetation cease, or a gale of wind up-root it, a statue of some public man-as Cook, Banks, Phillip, Lang-might appropriately replace it. Our country's memorials are all dispersed on the southern side of the city, and why not put up one or two on the northern? Kirribilli Point also would be a prominent situation for a statue. The historic tree is a fine specimen of the Ficus australis or Port Jackson fig. The roots and earth are confined in a substantial cement casing, the height of which apparently shows that the original level of the roadway was cut down 5ft 6in through boulders and solid rock. A portion of the earth, was, however, filled in when the cement was put there. The tree shows slight signs of decay. A large piece of branch dropped away from the top about a year ago. and the roots cling to almost bare rock. Indeed, it is wonderful how this sturdy specimen has so long withstood the south-easterly gales. Mr. H. T. Green formerly lived in a house in an acre of ground where this tree stands. This is the house shown in our picture of Milson's Point in 1854. In 1850 his father, Mr. George Green, leased the place from Mr. Robert Campbell: and for long afterwards the street lading to the horse ferry was known as Green's-lane. A colored plan framed and glazed, showing the ferry company's land and frontages, is exhibited on the trunk and bears the name Green's-lane. This plan and its contents are a puzzle to the many passers-by, not being within reading distance. In Mr. Green's painting there are no signs of any dwelling except this house. In the foreground of the first picture, to the right, is a low stone wall, which was the original landing-place for passengers from the steamers. This was so used for some years prior to the erection of the wharf to the left, which was a simple wooden platform built out on plies, and without any office accessories. 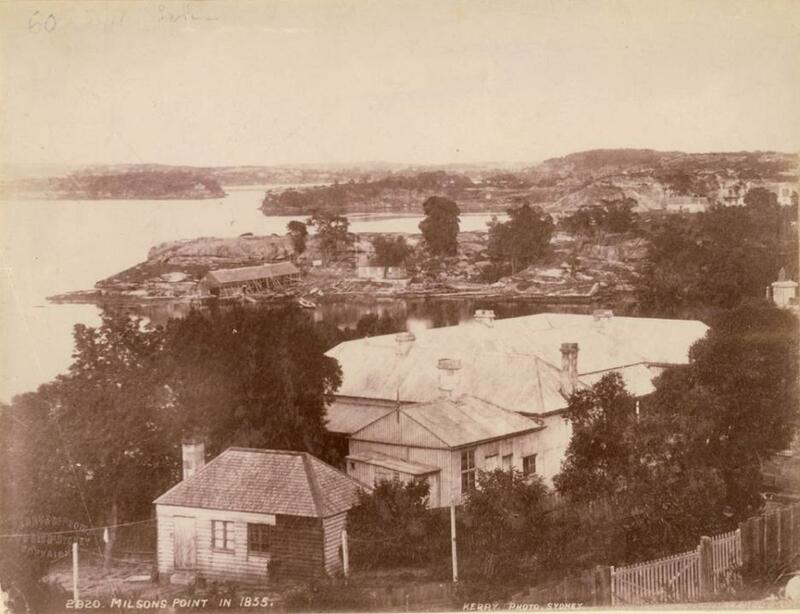 Milson's Point and Kirribilli in 1859. (From a Photo, by the late Mr. B. Hunt. In earlier times Australian aborigines were numerous hereabouts. They called the Sydney camp Warrane. One of the North Sydney tribes was called Wallumatta. The Cammeray tribe were the most powerful on the Shore. The natives' huts, which were invariably clustered closely together, were of wattle bent into an arch, with boughs interwoven, and occasionally covered with tea-tree bark. Some dwellings were large enough to hold a dozen blacks. A favorite camping ground was near the Point. For many years after white settlement set in on that side of the harbor there were no Europeans' buildings nearer than the Lily of St. Leonards Hotel, which still stands on the same site in Alfred street, with modern additions. The Lily of St. Leonards was the third hostelry opened on the Shore. The first hotel established was the Fig-tree, at Blue's Point-road, by Mr. Thomas Redgrave, in 1841. The second was the Union Inn, on Lane Cove-road, near the Crow's Nest, by Mr. Burns, in 1843. In 1845 Mr. J. Whitford, often called Mr. Whitfield, opened the Lily of St Leonards. After passing through the hands of two other proprietors, the hotel came into the possession of Mr. W. Dind sen., the well-known boniface, and at one time a theatrical manager and lessee in Sydney. Subsequently Mr. Dind built the hotel a little further up the road, on the right, for his son. The reason for the curious name of the hotel is a mystery to many at the present day. It seems, indeed, to embody a piece of the humor of the early days, for in Mr. Dind's time the painted sign of the hotel was an aboriginal woman. The notion of painting the Lily of St. Leonards was not a work of supererogation. The writer is indebted to the Hon. Geo. Thornton, M.L.C., for the information as to the name. Milson's Point was named after Mr. James Milson, sen., one of its oldest settlers. The name is often, but erroneously, spelt Milsom, even in municipal and Government maps. Mr. Milson was one of the earliest settlers here, and a public spirited man His son, the present Mr. Jas. Milson, was one of the first to inaugurate a steam ferry between the Point and Sydney. In this he was assisted by Deputy Commissaries Miller and Walker, after whom two of the principal streets are named. By the way, there is quite a plethora of streets on the Shore named after early Governors or residents-Pitt, Campbell, Brisbane, Fitzroy, Berry, Lord, Paul, Lavender, Blue, Bent, Bloxsome, Broughton, Holtermann, and so on. In other cases the old names have been altered. The first steam ferryboat from Milson's Point was called the Princess, and was built by Mr. G. Budevent, of Balmain. She was, in fact, a steam punt for the transit of horses and vehicles as well as passengers, but her running was not a financial success. Later on, Captain Joseph Gerrard and Captain Thomas Gerrard ran the steamer Fairy Queen, often called the Ferry Queen, built by Mr. Chowne, of Pyrmont. In 1854 a company was formed, and a steamer imported from England in sections was put together in Sydney. It was named the Herald, and ran between Blue's and Miller's Points. The Gerrard Brothers then transferred the running of their steamboats to Milson's Point. Messrs. James Milson, jun., F. Lord, W. Tucker, C. Frith, and others formed the first steam ferry company, having the boats Kirribilli and Alexandria for passengers, and the Transit for vehicles. By keen competition the fares were reduced from one shilling each way to sixpence each way, and ultimately to threepence. In 1878 this company sold out to the present North Shore Ferry Company, and Captain Summerbell was appointed manager. The fare was then reduced to twopence, and finally, about ten years ago, to one penny each way. Thirty years back there was a steam ferry from Circular Quay to Allison's Point every quarter of an hour from 8 a.m. to 7 p.m., and from the site of the present Pottinger-street (Macnamara's Wharf), Sydney, near Windmill-street, to Blue's Point, the same-each with threepenny fares. At that period the total daily passenger traffic did not exceed 150. Notwithstanding the healthy air and the beautiful scenery of the district, early settlement was retarded through the irregularity of communication, also by holders locking up the land in the assured hope of its increasing in worth from year to year, on account of its contiguity to Sydney. In the early times land was leased on the Shore at £3 per annum per acre, and of late years many allotments have realised at the rate of £20 to £50 per acre per annum. Diaries of early colonists refer to the density of forests on North Shore. Colonel Collins, (Secretary of. the Colony), and many other early officials say that the land was heavily timbered down to the water's edge with trees of the banksia and eucalypti class. A striking instance of the dense setting of the forest around Milliser's Point is instanced. On November 6, 1789, Francis Hill, a midshipman of H.M.S. Sirius, and a nephew of the celebrated Mr. Dyson (Solicitor to the Admiralty), after a visit to Governor Phillip at Sydney Cove, was rowed across the harbor, and landed at what is now Milson's Point. Mr. Hill set off to walk two miles through the dense bush and forest to join his ship, which was hove down in Careening Cove, he was never again seen, and must have either lost his way and starved, or more probably was murdered by the blacks, he being unarmed. Search parties were sent out for several days, and guns were fired, but not a trace of the young middy could be found. The north side of Sydney Harbor from Bradley's Head on the east to Bald's Head on the west was called Cammeray by the aborigines, as was also the perpetual and hereditary name of the chief of the gal-tribe or clan. The aborigines there were called Cammeray-gal. They used to celebrate their great national rite of boora at Milson's Plaint, and hundreds of blacks came from all the country side, and from distant pants, to witness the ceremonies. In April, 1790, half the blacks of Port Jackson were carried off by smallpox. The plague causing this great mortality must have been brought out in a ship by Europeans. The summary havoc caused by the visitation has no parallel in the history of the blacks. They were found lying dead or dying on every beach about the 'Shore. Among the most noted blacks of North Shore were King Bungaree and his wife. Her Majesty was colloquially known as Queen Gooseberry. Bungaree was the chieftain of the northern(Newcastle) natives, and performed many signal services on sea and land for the early colonial Governments. He was much patronised by Governors Hunter, King, Bligh, Macquarie, and Brisbane. Under Hunter, Bungaree accompanied Captain Flinders on his survey of the north, and south coasts. Under Bligh and Macquarie, the sable monarch was useful as a tracker. He was present at the first settlement of Newcastle. In 1815 Governor Macquarie gave him land for an encampment for his tribe between Milson's Point and George's Head. Every King's Birthday Governor Macquarie assumed a new uniform, and his discarded red coat, with large epaulettes, and cocked hat were invariably presented to King Bungaree- Clothed in the cast-off dress of vice royalty (minus trousers and boots, which nothing could induce him to wear), he loved to parade North Shore and Sydney. At first he preferred the official society to that of the convicts, bait by degrees he became addicted to European vices, and his taste for select society was vitiated. He was a splendid mimic, and could with marvellous accuracy imitate the gestures of various Governors and leading officials. Bungaree died on November 24, 1830, and he was buried on Garden Island, close to the tombs of Judge-Advocate Bent and Major John Ovens, who died several years before. When the island was made an Imperial naval depot the bodies were removed to St. Thomas's Church burial ground at North Sydney. Bungaree's Queen survived her husband nearly twenty years. She was buried on North Shore, and the remains were since removed to Devonshire-street Cemetery, Redfern, where her epitaph is still decipherable, it is said of Queen Gooseberry that she was more droll than witty, and she was quick at hitting off the weak points of the residents. When King Bungaree and Queen Gooseberry died, the only prominent Australian black left in the neighborhood was Tommy Jones, a comic fellow, who cadged and did odd jobs for a living. He was probably the nearest approach to a Sam Weller which the aboriginal Australian race ever produced, and was by no means devoid of intelligence. Tommy was, however, incorrigibly lazy, and although he could pull a pair of boots on occasion, he infinitely preferred; a present of bread, fish, and tobacco, without work. He was a veritable Weary Waggles. He was buried in the grounds of the late Captain Shairp (often, but erroneously, spelt Sharp), at the junction of Alfred and M'Dougal streets, close to the site of the Gas Company, and nearly opposite the present Brisbane House. One of our illustrations represents Milson's Point in 1859. It shows more of the Kirribilli' side of the Point, and in the distance Lavender Bay, Goat Island, and the Parramatta River. This picture is also from a photograph by Mr. Robert Hunt. The large cottage In the foreground' was the residence of Mr. Riley at the time the view was taken, but is now occupied by Mrs.. Cope. The old cottage of Mr. George Green, and the adjacent boat-building sheds, form a striking contrast to the present. *The Gentleman who was the author of Manual of Photography was in fact another Robert Hunt, who was equally fascinated with early photography. This Robert Hunt (6 September 1807 – 17 October 1887), was a scientist and antiquarian,born at Devonport, Plymouth, in the United Kingdom. He was involved in statistical, mineralogical and other studies. In 1840, Hunt became secretary to the Royal Cornwall Polytechnic Society at Falmouth. Here he met Robert Were Fox, and carried on some physical and chemical investigations with him. Mr Hunt in UK took up photography with great zeal, following Daguerre's discovery, developed the actinograph and introducing business processes. His Manual of Photography (1841, ed. 5, 1857) was the first English treatise on the subject. He also experimented generally on the action of light, and published Researches on Light (1844). We have placed the first work mentioned below for you to read. Mr. Robert Hunt, C.M.G., Deputy Master of the Sydney Mint, died at his residence last week after a somewhat lengthy illness. About three months since Mr. Hunt became seriously unwell, and had to take to his bed. He partly recovered and returned to his duties only to have a relapse and finally succumbed to aneurism after great suffering. Mr. Hunt was born in London in 1830.He was appointed chief clerk of the bullion office in the Sydney Mint in July, 1853, served in the melting and refining departments till September,1870, and was transferred to the Melbourne Mint 1st October, 1870, and promoted to be superintendent of bullion office, and served under General Sir Edward Ward until June, 1876. On the departure of Sir Edward on leave of absence Mr. Hunt was appointed Acting Deputy Master, which post he held until the end of 1877, when he was appointed Deputy Master of the Mint at Sydney. He was made a C.M.G. in 1888. From his position Mr. Hunt was unable to take any prominent part in public affairs, but he displayed a warm interest in philanthropic matters, and was for some years hon. treasurer of Prince Alfred Hospital. He was also a member of the Royal Society, and took a keen interest in the Museum, which had the benefit of his assistance on many occasions. Mr Hunt of the Mint agreed to go photographing with me and accordingly we started out about 2 p.m. last Saturday … for Middle Harbour, intending to camp out all night and photograph in the calm clear air of early morning. Hunt’s boat is a beautiful light skiff or wager boat named the Terror … [at Middle Head] our photographic zeal was so incited by the bold water-worn cliffs that we decided on landing my lighter apparatus, and taking them off … this was not easily done, nor, after spending an hour and a half over four trials, did we get at all a perfect photograph. After camping overnight at Willoughby Falls, they finally managed to take photographs which satisfied them: 'Hunt has since printed and mounted one of his plates, producing a really beautiful picture, and certainly the best he has taken. My plate is smaller, and has a slight defect, but otherwise ought to turn out even better’. In December 1858, together with other amateur photographers, including Professor John Smith , M.F. Moresby and their superior at the Mint, Captain Edward Ward , they exhibited their work at the first photographic conversazione of the Philosophical (Royal) Society of New South Wales. Then, on 22 December 1859, the Sydney Morning Herald reported that the second photographic exhibition of the Philosophical Society contained: 'Twelve views around Sydney from collodion negatives, by Mr Hunt; six large photographs (imported); [and] twenty-three stereographs, from collodion negatives by Messrs. Hunt, Jevons, Moresby and Captain Ward’. Hunt married Mary Paul in Sydney on 25 November 1860.